The City Municipality of Bremen is a Hanseatic city in northwestern Germany, which belongs to the state Free Hanseatic City of Bremen or shortly Bremen.A commercial and industrial city with a major port on the River Weser, Bremen is part of the Bremen/Oldenburg Metropolitan Region, with 2.4 million people. Bremen is the second most populous city in Northern Germany and tenth in Germany. The City Municipality of Bremen is a Hanseatic city in northwestern Germany, which belongs to the state Free Hanseatic City of Bremen or shortly Bremen. A commercial and industrial city with a major port on the River Weser, Bremen is part of the Bremen/Oldenburg Metropolitan Region, with 2.4 million people. Bremen is the second most populous city in Northern Germany and tenth in Germany. Bremen is a major cultural and economic hub in the northern regions of Germany. Bremen is home to dozens of historical galleries and museums, ranging from historical sculptures to major art museums, such as the Übersee-Museum Bremen. Bremen has a reputation as a working class city. Along with this, Bremen is home to a large number of multinational companies and manufacturing centers. Companies headquartered in Bremen include the Hachez chocolate company and Vector Foiltec. Four-timeGerman football championsWerder Bremen are also based in the city. Bremen is some 60 km (37 mi) south from the Weser mouth on the North Sea. With Bremerhavenright on the mouth the two comprise the state of the Free Hanseatic City of Bremen (official German name: Freie Hansestadt Bremen). Many of the sights in Bremen are found in the Altstadt (Old Town), an oval area surrounded by the Weser River, on the southwest, and the Wallgraben, the former moats of the medieval city walls, on the northeast. The oldest part of the Altstadt is the southeast half, starting with the Marktplatz and ending at the Schnoor quarter. The Marktplatz (Market square) is dominated by the opulent façade of the Town Hall of Bremen. The building was erected between 1405 and 1410 in Gothic style, but the façade was built two centuries later (1609–12) inRenaissance style. The Town Hall is the seat of the President of the Senate of Bremen. Today, it hosts a restaurant in original decor with gigantic wine barrels, the Ratskeller in Bremen, and the wine lists boasts more than 600—exclusively German—wines. It is also home of the twelve oldest wines in the world, stored in their original barrels in the Apostel chamber. In July 2004, along with the Bremen Roland, the building was added to the list of UNESCO World Heritage Sites. Two statues stand to the west side of the Town Hall: one is the statue Bremen Roland (1404) of the city's protector, Roland, with his view against theCathedral and bearing Durendart, the "sword of justice" and a shield decorated with an imperial eagle. The other near the entrance to theRatskeller is Gerhard Marcks' bronze sculpture (1953) Die Stadtmusikanten(Town Musicians) which portrays the donkey, dog, cat and rooster of theGrimm Brothers' fairy tale. Other interesting buildings in the vicinity of the Marktplatz are the Schütting, a 16th-century Flemish-inspired guild hall, Rathscafé, Raths-Apotheke, Haus der Stadtsparkasse and the Stadtwaage, the former weigh house (built in 1588), with an ornate Renaissance façade, and the nearby Essighaus, once a fine Renaissance town house. The façades and houses surrounding the market square were the first buildings in Bremen to be restored after World War II, by the citizens of Bremen themselves. St Peter's Cathedral (13th century), to the east of the Marktplatz, with sculptures of Moses and David, Peter and Paul and Charlemagne. On Katherinenklosterhof to the northwest of the cathedral, a few remaining traces can be found of St Catherine's Monastery dating back to the 13th century. The Liebfrauenkirche (Our Lady's Church) is the oldest church of the town (11th century). Its crypt features several impressive murals from the 14th century. Off the south side of the Markplatz, the 110 m (120 yd) Böttcherstraße was transformed in 1923–1931 by the coffee magnate Ludwig Roselius, who commissioned local artists to convert the narrow street (in medieval times, the street of the barrel makers) into an inspired mixture of Gothic and Art Nouveau. It was considered "entartete Kunst" (degenerate art) by the Nazis. Today, the street is one of Bremen's most popular attractions, with theGlockenspiel House at No. 4 with its carillon of Meissen porcelain bells. At the end of Böttcherstraße, by the Weser bank, stands the Martinikirche (St Martin's Church), a Gothic brick church built in 1229, and rebuilt in 1960 after its destruction in World War II. Tucked away between the Cathedral and the river is the Schnoor, a small, well-preserved area of crooked lanes, fishermen's and shipper's houses from the 17th and 18th centuries, now occupied by cafés, artisan shops and art galleries. The Convent of Saint Birgitta (Birgittenkloster) founded in 2002 is a small community of just seven nuns offering guest accommodation. Schlachte, the medieval harbour of Bremen (the modern port is some kilometres downstream) and today a riverside boulevard with pubs and bars aligned on one side and the banks of Weser on the other. The Viertel district to the east of the old town combines rows of 19th-century Bremen Houses (Bremer Häuser) with museums and theatres along the city's cultural mile. The Nasir Moschee is the first purpose built mosque of the Ahmadiyya Muslim Community in Bremen. The Kunstsammlungen Böttcherstraße, an art museum in expressionist architecture from Bernhard Hoetger with paintings from the 20th century fromPaula Modersohn-Becker. The Weserburg Museum für moderne Kunst ("Weserburg Modern Art Museum"), a modern art museum located in the middle of the Weser River. The marshes and moraines near Bremen have been settled since about 12,000 BC. Burial places and settlements in Bremen-Mahndorf and Bremen-Osterholz date back to the 7th century AD. Since The Renaissance, some scientists have believed that the entry Fabiranum orPhabiranon in Ptolemy's Fourth Map of Europe, written in 150 AD, refers to Bremen. But Ptolemy gives geographic coordinates, and by these dates Phabiranon is situated northeast of the mouth of river Visurgis (Weser). At that time the Chauci lived in the area now called north-western Germany or Lower Saxony. By the end of the 3rd century, they had merged with the Saxons. During the Saxon Wars (772–804) the Saxons, led byWidukind, fought against the West Germanic Franks, the founders of the Carolingian Empire, and lost the war. Charlemagne, the King of the Franks, made a new law, the Lex Saxonum. This law stated that Saxons were not allowed to worship Odin (the god of the Saxons), but rather that they had to convert to Christianity on pain of death. This period was called the Christianisation. In 787 Willehad of Bremen was the first Bishop ofBremen. In 848 the archdiocese of Hamburg merged with the diocese of Bremen into Hamburg-Bremen Archdiocese, seated in Bremen, and in the following centuries the archbishops of Hamburg-Bremen were the driving force behind theChristianisation of Northern Germany. In 888 Archbishop Rimbert, managed to get Kaiser Arnulf of Carinthia, the Carolingian King of East Francia, to grant Bremen the right to hold its own markets, to mint its own coins and make its own customs laws. The city's first stone walls were built in 1032. Around this time trade with Norway, England and the northern Netherlands began to grow, thus increasing the importance of the city. In 1186 the Bremian Prince-ArchbishopHartwig of Uthlede and his bailiff in Bremen confirmed—without generally waiving the prince-archiepiscopal overlordship over the city—the Gelnhausen Privilege, by which Frederick I Barbarossa granted the city considerable privileges. The city was recognised as a political entity with its own laws. Property within the municipal boundaries could not be subjected to feudal overlordship; this also applied to serfs who acquired property, if they managed to live in the city for a year and a day, after which they were to be regarded as free persons. Property was to be freely inherited without feudal claims for reversion to its original owner. This privilege laid the foundation for Bremen's later status of imperial immediacy (Free Imperial City). In fact, however, Bremen did not have complete independence from the Prince-Archbishops, in that there was no freedom of religion, and burghers were still forced to pay taxes to the Prince-Archbishops. Bremen played a double role; it participated in the Diets of the neighbouring Prince-Archbishopric of Bremen as part of the Bremian Estates and paid its share of taxes, at least when it had previously consented to this levy. Since the city was the major taxpayer, its consent was generally sought. In this way the city wielded fiscal and political power within the Prince-Archbishopric, while not allowing the Prince-Archbishopric to rule in the city against its consent. In 1260 Bremen joined the Hanseatic League. The harbour of Vegesack became part of the city of Bremen in 1803. In 1811,Napoleon invaded Bremen and integrated it as the capital of theDépartement de Bouches-du-Weser(Department of the Mouths of the Weser) into the French State. In 1813, the French—as they retreated—withdrew from Bremen. Johann Smidt, Bremen's representative at the Congress of Vienna, was successful in achieving the non-mediatisation of Bremen, Hamburg and Lübeck by which they were not incorporated into neighbouring monarchies, but became sovereign republics. Bremen joined the North German Confederation in 1867 and four years later became an autonomous component state of the new-founded German Empire and its successors. The first German steamship was manufactured in 1817 in the shipyard of Johann Lange. In 1827, Bremen, under Johann Smidt, its mayor at that time, purchased land from the Kingdom of Hanover, to establish the city of Bremerhaven (Port of Bremen) as an outpost of Bremen because the river Weser was silting up. The shipping company Norddeutscher Lloyd (NDL) was founded in 1857. Lloyd was a byword for commercial shipping and is now a part of Hapag-Lloyd. Beck's Brewery was founded in 1837 and remains in operation today as part of Anheuser-Busch InBev. In 1872, the Bremen Cotton Exchange was founded. A Soviet Republic of Bremen existed from January to February 1919 in the aftermath of World War I before it was overthrown by Gerstenberg Freikorps. Henrich Focke, Georg Wulf and Werner Naumann founded Focke-Wulf Flugzeugbau AG in Bremen in 1923; the aircraft construction company as of 2010forms part of Airbus, a manufacturer of civil and military aircraft.Borgward, an automobile manufacturer, was founded in 1929, and is today part ofDaimler AG. The villages of Grohn, Schönebeck, Aumund, Hammersbeck, Fähr, Lobbendorf, Blumenthal, Farge and Rekum became part of the city of Bremen in 1939. The Bremen-Vegesack concentration camp operated during World War II. Following the bombing of Bremen in World War II, the British 3rd Infantry Division under General Whistler captured Bremen in late April 1945. In 1946 Bremen's mayor Wilhelm Kaisen (SPD) travelled to the U.S. to re-establish Bremen's statehood, as Bremen had traditionally been a city-state, in order to prevent its incorporation into the state of Lower Saxony in the British zone of occupation. In 1947 the city became an enclave, part of the American occupation zone surrounded by the British zone. In 1947, Martin Mende founded Nordmende, a manufacturer of entertainment electronics. The company existed until 1987. OHB-System, a manufacturer of medium-sized space-flight satellites, was founded in 1958. The University of Bremen, founded in 1971, is one of 11 institutions classed as an "Elite university" in Germany, and teaches approximately 23,500 people from 126 countries. Bremen has a moderate oceanic climate (Köppen climate classification Cfb) due to its proximity to the North Sea coast and temperate maritime air masses that move in with the predominantly westerly winds from the Atlantic Ocean. However, periods in which continental air masses predominate may occur at any time of the year and can lead to heat waves in the summer and prolonged periods of frost in the winter. In general though, extremes are rare in Bremen and temperatures below −15 °C (5.0 °F) and above 35 °C (95.0 °F) occur only once every couple of years. The record high temperature was 37.6 °C (99.7 °F) on 9 August 1992, while the record low temperature was −23.6 °C (−10.5 °F) on 13 February 1940. Being at some distance from the main North Sea, Bremen still has a somewhat wider temperature range than Bremerhaven that is located on the mouth of Weser. Average temperatures have risen continually over the last decades, leading to a 0.6 °C (1 °F) rise in the mean annual temperature between 1961–90 and 1981–2010 reference periods. As in most parts of Germany, the year 2014 has been the warmest year on record averaging 11.1 °C (52.0 °F), making Bremen the second-warmest German state after Berlin in 2014. While Bremen is located in the comparatively cloudy northwestern part of Germany, there has been a significant increase in average sunshine hours over the last decades, especially in the months of April, May and July, causing the annual mean to rise by 62 hours between the two reference periods mentioned above. This trend has continued over the last 10 years which average 1614 hours of sunshine, a good 130 hours more than in the international reference period of 1961–90.Nevertheless, especially the winters remain extremely gloomy by international standards with December averaging hardly more than one hour of sunshine (out of 7 astronomically possible) per day, a feature that Bremen shares with most of Germany and its neighbouring countries, though. Precipitation is distributed fairly even around the year with a small peak in summer mainly due to convective precipitation, i.e. showers and thunderstorms. Snowfall and the period of snow cover are variable; whereas in some years, hardly any snow accumulation occurs, there has recently been a series of unusually snowy winters, peaking in the record year 2010 counting 84 days with a snow cover. Nevertheless, snow accumulation of more than 20 centimetres (8 in) remains exceptional, the record being 68 centimetres (26.8 in) of snow on 18 February 1979. The warmest months in Bremen are June, July, and August, with average high temperatures of 20.2 to 22.6 °C (68.4 to 72.7 °F). The coldest are December, January, and February, with average low temperatures of −1.1 to 0.3 °C (30.0 to 32.5 °F). Typical of its maritime location, autumn tends to remain mild well into October while spring arrives later than in the southwestern parts of the country. Bremen lies on both sides of the River Weser, about 60 kilometres (37 miles) upstream of its estuary on the North Sea and its transition to the Outer Weser by Bremerhaven. Opposite Bremen's Altstadtis the point where the "Middle Weser" becomes the "Lower Weser" and, from the area of Bremen's port, the river has been made navigable to ocean-going vessels. The region on the left bank of the Lower Weser, through which the Ochtum flows, is the Weser Marshes, the landscape on its right bank is part of the Elbe-Weser Triangle. The Lesum, and its tributaries, the Wümme and Hamme, theSchönebecker Aue and Blumenthaler Aue, are the downstream tributaries of the Weser. The city's municipal area is about 38 kilometres (24 miles) long and 16 kilometres (9.9 miles) wide. In terms of area, Bremen is the thirteenth largest city in Germany; and in terms of population the second largest city in northwest Germany after Hamburg and the tenth largest in the whole of Germany . Bremen lies about 50 kilometres (31 miles) east of the city of Oldenburg, 110 kilometres (68 miles) southwest of Hamburg, 120 kilometres (75 miles) northwest of Hanover, 100 kilometres (62 miles) north of Minden and 105 kilometres (65 miles) northeast of Osnabrück. Part of Bremerhaven's port territory forms an exclave of the City of Bremen. According to data from the Organization of Economic Cooperation and Development, Bremen had a GDP per capita of $53,379 in 2013, higher than the average for Germany as a whole. For comparison, in 2013, the World Bank reported Germany had a GDP per capita of $46,268, and the EU overall had a GDP per capita of $35,408 in the same year. Bremen is the second development centre of the region, after Hamburg. It forms part of the production network of Airbus SAS and this is where equipping of the wing units for all widebody Airbus aircraft and the manufacture of small sheet metal parts takes place. Structural assembly, including that of metal landing flaps, is another focal point. Within the framework of Airbus A380 production, assembly of the landing flaps (high lift systems) is carried out here. The pre-final assembly of the fuselage section (excluding the cockpit) of the A400M military transport aircraft takes place before delivery on to Spain. More than 3,100 persons are employed at Bremen, the second largest Airbus site in Germany. As part of the Centre of Excellence – Wing/Pylon, Bremen is responsible for the design and manufacture of high-lift systems for the wings of Airbus aircraft. The entire process chain for the high-lift elements is established here, including the project office, technology engineering, flight physics, system engineering, structure development, verification tests, structural assembly, wing equipping and ultimate delivery to the final assembly line. In addition, Bremen manufactures sheet metal parts like clips and thrust crests for all Airbus aircraft as part of the Centre of Excellence – Fuselage and Cabin. There is also a Mercedes-Benz factory in Bremen, building the C, CLK, SL, SLK, and GLK series of cars. Beck & Co's headlining brew Beck's and St Pauli Girl beers are brewed in Bremen. In past centuries when Bremen's port was the "key to Europe", the city also had a large number of wine importers, but the number is down to a precious few. Apart from that there is another link between Bremen and wine: about 800 years ago, quality wines were produced here. The largest wine cellar in the world is located in Bremen (below the city's main square), which was once said to hold over 1 million bottles, but during WWII was raided by occupying forces. A large number of food producing or trading companies are located in Bremen with their German or European headquarters: Anheuser-Busch InBev (Beck's Brewery), Kellogg's, Kraft Foods (Kraft, Jacobs Coffee, Milka Chocolate, Milram, Miràcoli), Frosta (frosted food), Nordsee (chain of sea fast food), Melitta Kaffee, Eduscho Kaffee, Azul Kaffee, Vitakraft (pet food for birds and fishes), Atlanta AG (Chiquita banana), chocolatier Hachez (fine chocolate and confiserie), feodora chocolatier. Bremen airport (IATA: BRE) is located in the south-west of the town and mostly caters to low-fare and holiday flights. The low-fare carrier Ryanair offers by far the most connections, spread all over Europe but with stronger focus on the Mediterranean (especially holiday destinations) and countries around the Baltic Sea. Apart from Ryanair and holiday specialists, there are a few high-fare business-oriented flights to specific destinations (like Toulouse, serving Airbus Group who has facilities in both cities), and feeder flights to major hub airports operated by flag carriers. If you want a smooth intercontinental connection to Bremen, your best bet is to fly with Star Alliance or SkyTeam. Star Alliance founder Lufthansa flies from Bremen to their hubs in Frankfurt and Munich, sister airline Germanwings to Stuttgart, while other alliance member Scandinavian Airlines flies to Copenhagen and Turkish Airlines to Istanbul. SkyTeam's founders Air France-KLM fly to Paris Charles de Gaulle Airport and Amsterdam-Schiphol. You can connect to the alliances' vast networks of intercontinental - as well as European - connections there. If you are cost conscious, it might work out cheaper to forgo the domestic flight on the last leg and use an air rail alliance such as rail&fly instead. Though thanks to the quirky nature of airline pricing, the exact opposite may be the case. Several domestic bus lines connect Bremen to the rest of Germany. Autobahn 1 runs to Hamburg in the north and Cologne in the south, but do check the traffic information! The A27 goes north to Bremerhaven and Cuxhaven and south towards Hanover, Braunschweig, Berlin and other eastwards connections. Much of Bremen (or at least the part frequented by tourists) can be negotiated by foot - the best way to explore the old city and its surrounding districts. In the west lie the cities Delmenhorst and Oldenburg and the Frisian islands. In the east you can travel to Verden, in the south to Osnabrück. 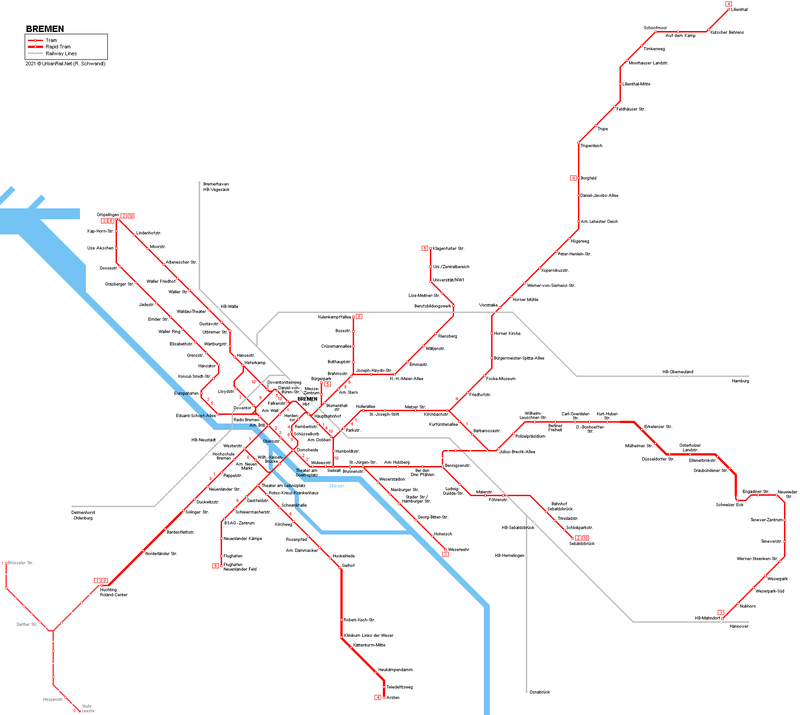 There are trains from the main station to the peripheral areas of Bremen (2 times per hour to North Bremen, to Mahndorf via Sebaldsbrück and to Hemelingen. See [www] for more information). Bremen offers an intensive public transportation network with trams and buses. For public transportation timetables and ticket fares see [www] (English). There are night buses and trams (indicated by an "N") running through almost the whole night on Fri/Sat and Sat/Sun, departing at :30 each hour from central station. Fares on the night network are €1 in addition to normal individual, group or day fares (2013). You can buy tickets on the bus or tram, but is slightly cheaper to buy a set of 4 rides or a day pass for individuals or groups, or a weekly pass for individuals. Note that on trains, tickets must be purchased before you board. You can find the map of the tram lines here [www]. Taxis are found nearly everywhere and every time, with a cost of about €1.25/km. The two main taxi companies are Taxi-Roland [www] (phone: 0049 421 14433) and Taxi-Ruf [www] (phone: 0049 421 14014). There is no need to book a taxi in advance. Taxi drivers and call center employees may have difficulties to understand a phone call in English. Taxi-Ruf has a smartphone app (which can be used to order a taxi) available for iPhone and Android. Schnoor is a den of tight lanes selling boutique style products including jewelry, African artifacts, paper models and a year round Christmas shop. There are also a lot of shops selling tourist souvenirs. Weekly markets are held on most of the squares around the Town Hall [www]. Lloyd Passage, Obernstrasse, Sögestraße are the main shopping streets with all the main High Street chains. Waterfront Shopping Centre, Waterfront Bremen, AG-Weser-Straße(Motorway A27, Junction 17 (Dreieck Bremen-Industriehäfen) to the freeway feeder A281 (Überseestadt-bound) you will see the Waterfront Bremen on the right side after approximately 4 kilometres. ), +49 421 33 05 199. Mon-Sat 10:00-20:00. A shopping and leisure centre with a unique location directly on the banks of the River Weser. As its name and location suggest, there is always a fresh wind blowing through and around the Waterfront: shopping, feasting, cinema and events assure high spirits all year round. The young centre was opened in September 2008 and offers more than 80 shops from fashion (PRIMARK, Desigual, Tommy Hilfiger, Clockhouse and many others) to shoes, jewellery, athletic apparel and equipment to leather goods and gifts—nearly everything the heart could desire. To nourish visitors, there is a gastronomic selection of more than 15 different venues in the Food Court and on the outdoor terrace, with its Weser panorama. There are events held regularly in and around the Waterfront: fashion shows, exhibitions, concerts or activities for children—something for everybody. In the Food Court there is also a 25-sqm screen where broadcasts of all Werder Bremen football matches and highlights of the German Football League can be viewed. Various prices. Several cafes and restaurants line the "Schlachte" [www] along the Weser river while other popular areas are the marketplace and the "Viertel" ("quarter") east of the Kunsthalle. Many traditional dishes from Bremen and Northern Germany are very satisfying. The region is famous for cabbage (Grünkohl- green cabbage), fish (smoked eel, herring, smelt in March), an old sailor´s meal called Labskaus (lobscouse) consisting of mashed potatoes, corned beef, onions, fried egg and beetroot or chick ragout (very fine) as well as red fruit jelly or Butterkuchen (cake with yeast and topped with lots of butter, sugar and almonds). You can find some fish restaurants in Böttcherstraße. "Knigge" is the name of a traditional coffee house in Bremen. The world-wide known Beck's Beer is brewed in Bremen. Guided brewery tours in English and German are offered Thursdays - Saturdays. The tour costs €10.50/person and lasts approximately 2 hours. The Ratskeller is a wine cellar and restaurant with a famous collection of wines and the oldest wines in Germany. If you like beer and pretzels, try the Schüttinger brewery house (next to Böttcherstraße) where several types of beer are brewed and served directly. Rathaus (Town Hall). this is one of the finest in Europe and as such has been included on the UNESCO World Heritage List. Building work started in 1410 and it is seen as an important display of the wealth and freedom of the city. Tours of the interior are conducted by the Tourist information office at 11AM, noon, 3PM and 4PM. Roland, Rathausplatz. this statue on the main square, in front of the town hall is of the Knight Roland who was a protector of trade. He appears in many European cities especially those involved in the Hanseatic league. Bremen's is considered one of the finest and is included with Town Hall on the World Heritage List. The standing figure is 5.47 m tall. Dom St. Petri (Cathedral of St Peter). is over 1200 years old, and its huge towered façade dominates the main square. the interior is impressive with some fine painted details on the ceilings. There is a treasury displaying the collection of the cathedral. Entrance is free, for €1 you can climb the Southern Tower offering nice views over the whole city. Böttcherstraße. Is the incredible Jugendstil (Art Nouveau) street that runs from the main square towards the river. There are many fine façades and courtyards all with large amounts of design detail. There is an impressive Glockenspiel that chimes at regular intervals. There are lots of shops and several museums, including the impressive Paula Modersohn-Becker Museum.Haus Atlantis (now the Hilton) has an impressive spiral staircase just inside, at the top of which is the staggering Himmelshaal (unfortunately it is not normally open to the public). Am Wall. is a lovely park next to the former defensive moat which offers a place to sit and relax. Schnoor. this area of twisting lanes is a lovely place to wander aimlessly looking at in the many shops and also at the world smallest hotel. Überseemuseum (Natural History and Ethnographic Museum), 13, Bahnhofsplatz D (near central station), +49 421 160 38101. Hafenmuseum Speicher XI, In the Überseestadt (Bus line 20 from railway station or tram line 3), +49 421 3038279. Housed in a former cotton warehouse. Models of ships used during the past. Stroll around the city center and visit the Schnoor-Viertel with its old buildings - most of them were built between the 15th and 18th century. If interested in arts visit the Bremer Kunsthalle [www] (museum of art) with one of north Germany's finest collections. If you like football, you can go to see a match of Werder Bremen [www], a team playing in the Bundesliga (German premier league). You can also visit their stadium (Weser Stadion) [www] for a few euros. Universum Bremen [www] is a hands-on science centre towards the north of the city. It is accessible by tram, or by a one hour walk from the main station through the Bürgerpark [www]. If you want to see green fields, cows, bikers and in line skaters, visit "Blockland"[www] (site in German with some pictures) to enjoy the agricultural side of Bremen´s nature. It is located near the river Wümme, roughly to the west of the university. You can bike or skate along the dyke and eat an ice-cream at one of the farms (some also sell organic food). In winter there is no ice-cream but there is ice-skating on the river and small creeks. Indoor ice skating is at Paradice, the skating hall in Walle ([www], site in German). Paradice is opened from October to February. A good way to get in touch with the locals is to stroll along the river Weser on the scenic Osterdeich, where - in good weather - lots of little groups hanging out on the grassy hills may invite you to barbecue with them or have a beer. Don't miss the beautiful Bürgerpark either, a beautiful, fairly large park right in the middle of the city, which has a little Central Park vibe to it. Have a drink in the reknowed "Emma" Café, rent a boat and row around the many little rivers, play mini-golf, or simply sit on the grass and enjoy some tasty ice cream. January 6: "Eiswette": a funny tradition where a tailor checks if he can cross the river Weser without getting wet feet. February: Carnival in Bremen, more South-American than Cologne style. June: "Vision Parade": techno parade along the Weser. "Breminale" music/art festival along the River Weser. August: International Bremen Summer circus festival "La Strada". "Festival Maritim" in Bremen-Vegesack (in the northern end of Bremen). October (2nd half): "Freimarkt" (free market), one of the biggest and oldest fairground festivals in Germany, north of the railway station. November: International Cutter Race / "Kutterpullen" tournament (rowing contest on the Weser river). December: Christmas market around the town hall and Schlachte at the river Weser. The monthly free event magazine MIX has hosts an event calendar online (German only) [www].